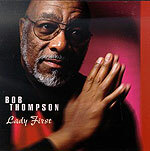 Bob Thompson's your typical veteran jazz artist: Just another middle-aged African-American living in West Virginia and leading the house band for a bluegrass radio program. Okay, Bob Thompson  who can be heard weekly on public radio's "Mountain Stage" (which, to be fair, welcomes far more than bluegrass artists to its program)  isn't the norm. And that goes for his playing, too: Every album this man makes is a whole new stylistic statement. While his previous album, "Ev'ry Time I Feel the Spirit," was a modern treatment of spirituals and hollers, his latest, "Lady First," is a straight-ahead collection of original jazz compositions that shows Thompson off as one of the finest pianists on the scene today. The opening track, "Arosa," written by Thompson and two of his sidemen on this session, is an immediately engaging tune  timeless, entrancing. Others will be covering this song for years to come. Most of the other songs are equally strong, and the mostly young sidemen backing Thompson are very polished  this is top-notch jazz on a very small label, with outstanding production to boot.